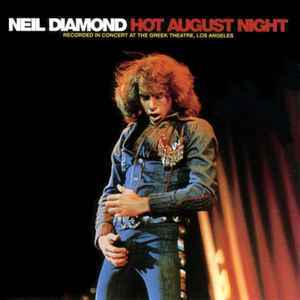 Hot August Night is a 1972 live double album by Neil Diamond. It is a recording of a Diamond concert on Thursday August 24, 1972, one of ten sold out concerts that Diamond performed that month at The Greek Theatre in Los Angeles. The album has become a great success for Diamond, and in Australia, it spent 29 weeks at number 1 on the album charts during 1973 & 1974. It was the number one charting album in Australia for the 1970s, entering the Australian album charts in late 1972 and was still charting in the top 20 in 1976. It re-entered the Australian top 10 in 1982. Anybody know anything about 1972 Hot August Night gold vinyl LP limited to 10 only pressings randomly distributed in Australia. LPs could be redeemed for ticket to a Neil Diamond Concert? There is no indication on the cover that the contents contained the special pressing. Just interested to know if its a myth or I am sitting on a valuable set. I have what looks to be the same as this one, but with the 4 pages of photos inside. Same MCA rainbow labels, but dead wax info isn't listed here. Mine is MG-MCA-4 - W7 #3 on record 1 side 4, MG-MCA-1 - W7 on side 1. Record 2 sides 2 and 3 are the same as above, with side number after the MCA but side 3 has #2 on it's deadwax. So would this be the 2nd Canadian pressing in 1972? Probably the best Neil Diamond concert ever recorded. A must have for fans of his music. Incredibly quiet pressing and amazing clarity and balance for a live show. I grew up with this record playing every weekend on my dad's turnatable. A true classic. One Disc has side one on the label and side 4 instead of 2 on side B. The second disc has 2/3 on a/b ??? Is it a miss print ? The quality of this NIMBUS double disc is excellent. Stunning stereo imagery with highly detailed dynamics. Not presented in a FATBOX however the rear sleeve notes that a cassette version is available, this would indicate an early pressing. Is this not a South African release? The front and back covers are the inside gatefold of the original vinyl. The gatefold right is the original back cover with a Gallo logo at bottom left, a South African company.